Electronic Snaking is a simple less expense approach to cleaning a residential drain or sewer. In most instances the job will be diagnosed and repaired in the same day. Here are a few examples of the types of jobs that electronic snaking is effective on. After years of cooking grease in the kitchen, hair in the bathroom drains, debris build-up in the laundry room, and small shrubbery in the storm sewers; electronic snaking may be the option for you. Jetting Services may be required in the instance that your sanitary or sewer lines are collapsed, clogged, or broken. Our high power jet sewer service will clear drains that have been damaged by concrete, tree roots, gravel, sand, and back-up material at the main sewer connection. Using 4000 pounds per square inch (psi), hydro-jetting has the power to burst open the toughest blockages and at the same time scours the full diameter of the pipe, flushing debris and leaving lines clear. There is no better way to get your pipes draining as well as the day they were installed, short of replacing them completely. 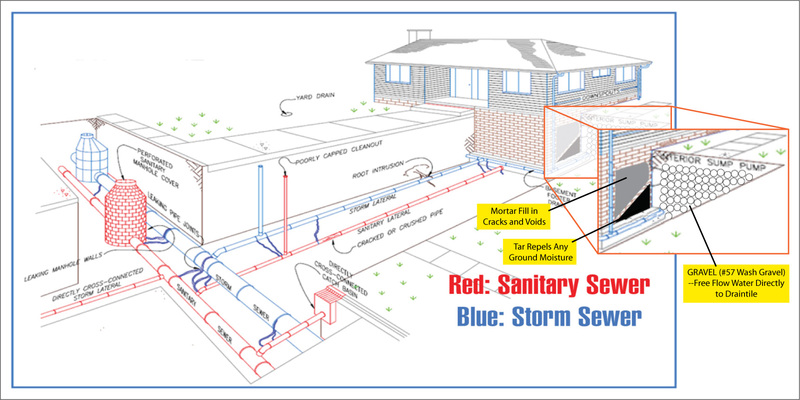 Sewer systems are underground drains and pipes that carry away rain water or sewage. Each time you flush the toilet or wash something down sink drains you create sewage or wastewater. Its is extremely important to keep sewers systems properly maintained; otherwise, damaged systems can become not only costly but also both a health and environmental hazard. Upon the purchase of a home, most people tend to forget that maintaining their sewer system is part of some of the responsibilities involved in home ownership. Although most sewers are publicly owned, the sewer laterals are entirely owned by the private property owner they serve. Homeowners are required to maintain the lateral from their home to the main sewer line that is typically located in the street or nearby easement. Maintaining the lateral includes keeping the lateral line flowing and free of debris such as roots or grease. No one is more knowledgeable or better equipped to maintain, inspect and repair your sewer system than MSA. We are the most reliable environmental contractor in Northeast Ohio. MSA has the most advanced sewer cleaning, inspection and rehabilitation equipment ready to work for you. Give us a call today!